Greetings all and merry Christmas. I was hoping for some advice/opinions. I am collecting a 16th century Nuremberg black and white half armour. 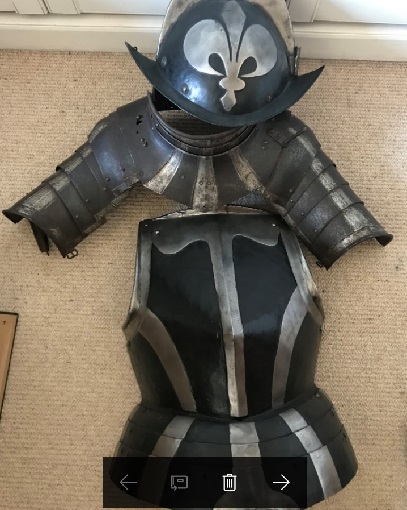 I have a collar and pauldrons which I bought from a British dealer, a couple of years ago, a morion (fleur-de-lys type) and a burgonet, which I bought from Tom Del Mar earlier this year, and I got a superb breastplate with three faulds from Tom DM earlier this month. To complete the armour I need at least a backplate, and preferably tassets as well. For the time being though, I have enough to be able to display on a stand. The black parts of the breastplate and both helmets have been refreshed with paint (so they truly are black) whereas the 'black' parts of the collar and pauldrons have faded to more of a brown-black colour. I don't have any certainty that the colouring of the collar/pauldrons is necessarily the very original finish, but it certainly hasn't been refreshed for a long time. I would like the pieces to match, obviously- but would repainting the faded pieces be a sort of vandalism? I'll get some photos up if it would be helpful/of interest. Don't repaint the pieces. Nearly always, restoration decreases the perceived value of an item. Dealers who are honest enough to admit a piece is restored will often offer a lower price based upon the fact that the piece is not 100% original. And yes, please attach photos so that the armour aficionados can look. Do get in touch with Wade Allen! I believe he has quite a few B&W pieces in his collection, and could surely share some insight about proper ways to go about maintaining your assembled harness. Good luck, and happy holidays! Here are some pictures of the ensemble so far.... As you can tell, I am no photographer! Sorry- they're too big to get off my phone onto here. I'll tinker with them and see what I can do. Thanks for the advice so far, much appreciated! Are the 'faded' areas free of paint? Photos really matter in this instance. If their colour is due to oxidation, it is no sin to paint over them. If the paint is modern, likewise. It would increase its value a little, actually, if it looks as it should, and it does not violate the First Commandment, 'Do not do things that are not REVERSIBLE'. I am a professional restorer, and it is those things that permanently alter the piece that are the bane of my existence! Thanks James. That sounds like sensible advice. Is there anything you'd suggest as an alternative, in order to bring out the colour of the non-freshed areas? This is a very common problem. A close-up of the unpainted munion would be useful. Is the unpainted patina a bit patchy, or is it pretty solid? If solid, I would rub it down with fine steel wool and then wax it with Simoniz. This will darken it a bit and increase its luster some. The big problem with the freshly painted parts is that the modern restorers are using off the shelf black paint (hopefully a primer paint), which really is black. The old stuff, which seems to have had a form of iron oxide as its pigment base, was not so. 'Black' rust is really a very dark magenta. This can be seen by looking at it in direct sunlight. Modern paint can be adjusted by adding a dash of red, till it matches. The modern paint can be brought down a bit by lightly rubbing with a grey ultrafine Scotchbrite pad. Or you could just brush on a coat of black metal primer onto the old finish. Be sure to use one that does NOT convert the oxide. Or, you could, if you are feeling particularly ambitious, as I advised earlier, rub and wax the munion and see if you can mix a paint that looks similar to apply to the recently painted parts. Regardless, do NOT damage the old finish. It's what I want to see when I am looking at real armour, not modern paint.